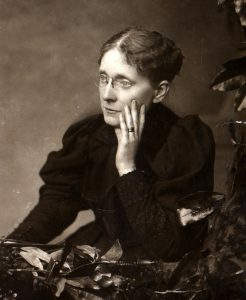 Frances Willard. Photo originally from the Library of Congress. Although Frances Willard was known for her leadership in the temperance movement, she was also a prominent suffragist and social progressive who battled against gender inequality and fought to give a voice to society’s disenfranchised. Lifting her own strong voice against the status quo, she forever changed accepted social norms. And her legacy includes an enduring model for transformative community organization. Frances Willard was born on September 28, 1839, in Churchville, New York to Josiah Willard and Mary Thompson Hill Willard, moving with her family first to Oberlin, Ohio and later to a farm near Janesville, Wisconsin. She spent most of her childhood there, educated at home by her mother, before graduating from North Western Female College in Evanston, Illinois and beginning a teaching career in schools in Pennsylvania and New York. She became the first dean of women at the Women’s College at Northwestern University, but shortly thereafter, gave up teaching to pursue work with the temperance movement. At a time when temperance was seen as advancing safety and security for women and their children, Frances participated in the founding convention of the Woman’s Christian Temperance Union (WCTU) and was elected its first corresponding secretary. While working to form local unions and build support for temperance, she also sought to broaden the WCTU’s reform movement to include women’s suffrage, other women’s rights, and education and labor reforms. In 1879, she was elected president of the WCTU, which under her leadership grew to be the largest organization of women in the 19th century. She saw the WCTU as a means to accomplish societal reform and train women to accomplish this reform. Under her leadership, WCTU members were empowered to become involved in local and national politics, to advocate for causes in which they believed, to make speeches, write letters, sign and distribute petitions and do whatever they could (since they could not vote) to drive change. Her involvement in one of the most powerful forces for social reform propelled Frances to worldwide fame. As a suffrage proponent, she urged women to work state-by-state to win suffrage, rather than focus exclusively on a constitutional amendment. She was successful in inspiring reluctant women to support suffrage and use their voting power to make and keep their towns dry. Under her leadership, the WCTU fought for broad social reforms, including equal pay for equal work, an eight-hour work day, world peace, the protection of women and children in the workplace, kindergartens, mothers’ clubs (the predecessor of the PTA), jail reform, uniform marriage and divorce laws, physical education in grade schools, higher education for women, choice of vocation, and equal opportunity. In failing health, Frances succumbed to influenza in 1898 at the age of 58. She was inducted into the National Women’s Hall of Fame in 2000. “The loves of women for each other grow more numerous each day, and I have pondered much why these things were. That so little should be said about them surprises me, for they are everywhere … In these days when any capable and careful woman can honorably earn her own support, there is no village that has not its examples of two hearts in counsel, both of which are feminine.” –Frances Willard. Frances Willard House Museum and Archives https://franceswillardhouse.org.